Inspirational leaders know the power of story. Effective managers and trainers use anecdotes for imagery and example. Good teachers and therapists know storytelling is a tool for personal transformation. StoryWorks is a handbook on speaking, writing and storytelling. It ranges from classic tools like the ‘rule of threes’ to the new mnemonic ‘five finger technique’. These are illustrated with stories from around the world: some are traditional tales, others are modern fables. They are accompanied by creative exercises to expand your narrative and storytelling skills. 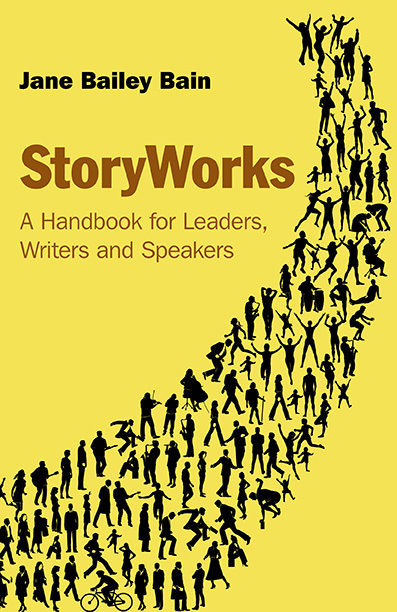 Whether you are a speaker or writer, a leader or coach, StoryWorks provides a great source of inspiration, narrative material and practical skills. StoryWorks will be published in May 2015. This entry was posted in Uncategorized and tagged Jane Bailey Bain, Power of Story, stories, story, Story Works, StoryWorks. Bookmark the permalink.